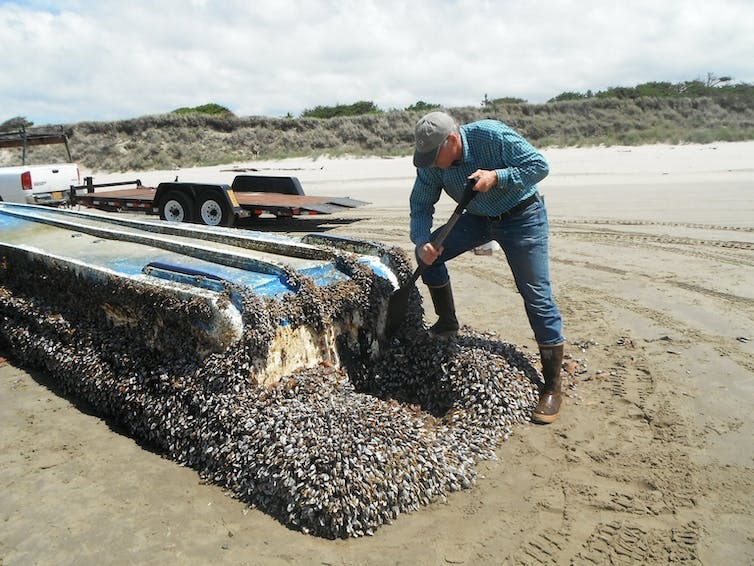 Japanese vessel washed ashore on Long Beach, Washington being inspected by John Chapman. When a foreign species arrives in a new environment and spreads to cause some form of economic, health, or ecological harm, it’s called a biological invasion. Often stowing away among the cargo of ships and aircraft, such invaders cause billions of dollars of economic loss annually across the globe and have devastating impacts on the environment. While the number of introductions which eventually lead to such invasions is rising across the globe, most accidental introduction events involve small numbers of individuals and species showing up in a new area. But new research published today in Science has found that hundreds of marine species travelled from Japan to North America in the wake of the 2011 Tōhoku earthquake and tsunami (which struck the east coast of Japan with devastating consequences). Marine introductions result from biofouling, the process by which organisms start growing on virtually any submerged surface. Within days a slimy bacterial film develops. After months to a few years (depending on the water temperature) fully formed communities may be found, including algae, molluscs such as mussels, bryozoans, crustaceans, and other animals. Current biosecurity measures, such as antifouling on ships and border surveillance, are designed to deal with a steady stream of potential invaders. But they are ill-equipped to deal with an introduction event of the scale recorded along most of the North American coast. This would be just as true for Australia, with its extensive coastlines, as it is for North America. 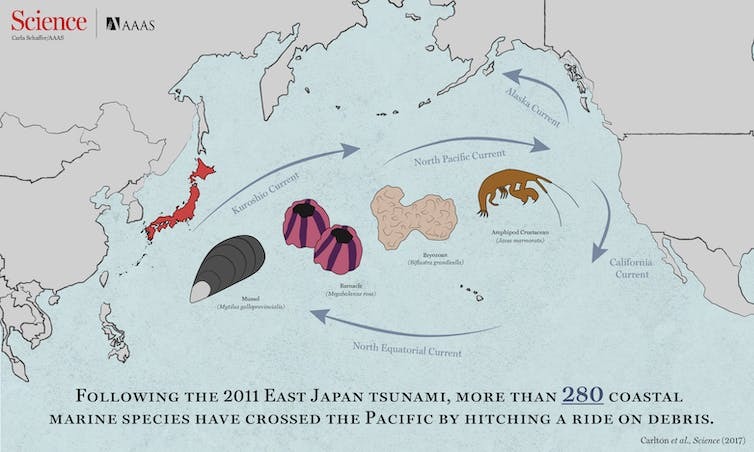 Marine animals were transported vast distances on tsunami debris. This research, led by James Carlton of Williams College, shows that over a few years after the 2011 earthquake and tsunami, many marine organisms arrived along the west coast of North America on debris derived from human activity. The debris ranged from small pieces of plastic to buoys, to floating docks and damaged marine vessels. All of these items harboured organisms. Across the full range of debris surveyed, scores of individuals from roughly 300 species of marine creatures arrived alive. Most of them were new to North America. The tsunami swept coastal infrastructure and many human artefacts out to sea. Items that had already been in the water before the tsunami carried their marine communities along with them. The North Pacific Current then transported these living communities across the Pacific to Alaska, British Columbia, Oregon, Washington and California. 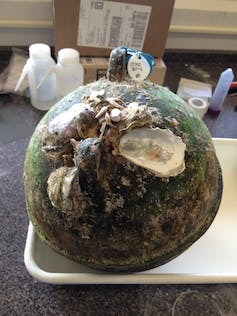 Japanese tsunami buoy with Japanese oyster Crassostrea gigas, found floating offshore of Alsea Bay, Oregon in 2012. What makes this process unusual is the way a natural extreme event – the earthquake and associated tsunami – gave rise to an extraordinarily large introduction event because of its impact on coastal infrastructure. The researchers argue that this event is of unprecedented magnitude, constituting what they call “tsunami-driven megarafting”: rafting being the process by which organisms may travel across oceans on debris – natural or otherwise. It’s not known how many of these new species will establish themselves and spread in their new environment. But, given what we know about the invasion process, it’s certain at least some will. Often, establishment and initial population growth is hidden, especially in marine species. Only once it is either costly or impossible to do something about a new species, is it detected. Biosecurity surveillance systems are designed to overcome this problem, but surveillance of an entire coast for multiple species is a significant challenge. Perhaps one of the largest questions the study raises is whether this was a once off event. Might similar future occurrences be expected? Given the rapid rate of coastal infrastructure development, the answer is clear: this adds a new dimension to coastal biosecurity that will have to be considered. 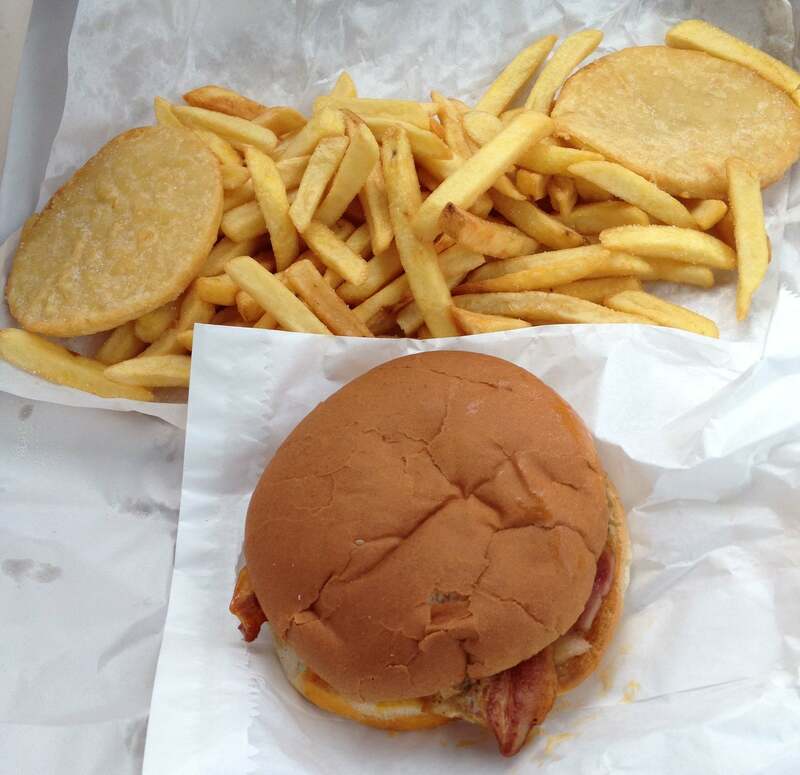 Investment in coastal planning and early warning systems will help, as will reductions in plastic pollution. But such investment may be of little value if action is not taken to adhere to, and then exceed, nationally determined contributions to the Paris Agreement. Without doing so, a climate change-driven sea level rise of more than 1 m by the end of the century may be expected. This will add significantly to the risks posed by the interactions between natural extreme events and the continued development of coastal infrastructure. In other words, this research has uncovered what might be an increasingly common new ecological process in the Anthropocene – the era of human-driven global change. The link below is to an article reporting on the threat to the world’s oceans by plastic and other debris in it. Debris from the terrible tsunami that hit Japan last year has begun arriving off North America.